How Could I Not Know That? Plus Some Knitting. Everyone has random gaps of knowledge–things that other people think that everyone knows. It’s great fun discovering them. I discovered one of mine this weekend when BF and I attended a local outdoor concert. A ’60s band was playing–someone with a very funny name that couldn’t quite retain in my memory, no matter how I tried. Henry’s Termites? Herman’s Hermaphrodites? 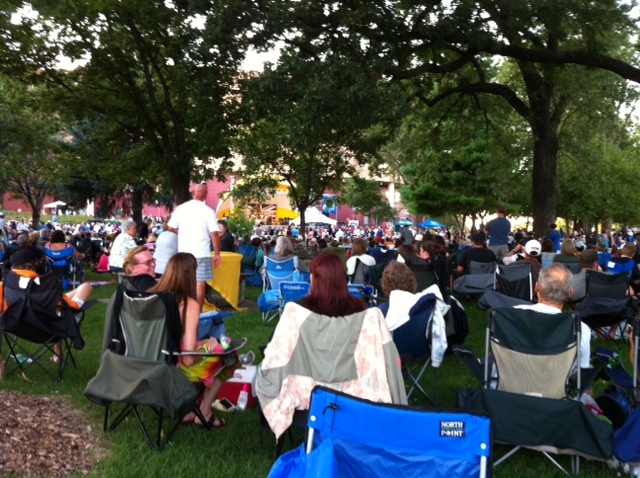 There was a very large crowd at the concert. Not another knitter in sight, though plenty of dancers as the show progressed. Yet somehow, I had never connected the songs together, nor had I ever heard of the name of the band. It was a beautiful night for knitting. I sat under the trees on a quilt made of blue jeans, working on my Dancing Cranes stole. I knitted until it was too dark to see. Only three rows left to knit, then the bind off. Previous What will the alien archaeologists make of my knitting bag in 10,000 years? I’ve had musicians/bands like that. I’m also occasionally surprised to discover a musician is attractive when someone accuses me of only liking him “cuz he’s hot”. It’s just more about the art than the artist for me. I’m a bit hopeless at connecting the dots like that. More so with actors than music. 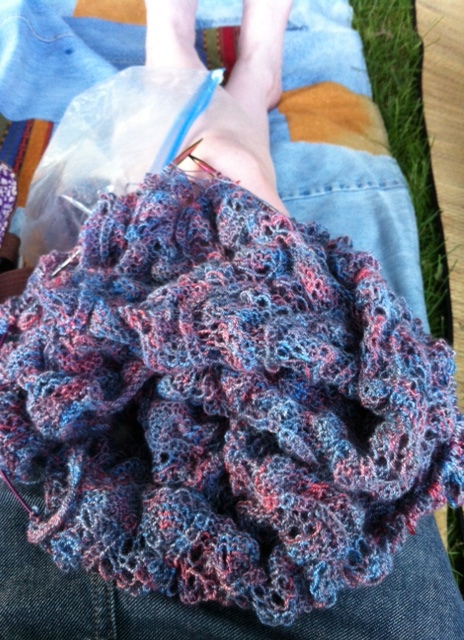 I always take my knitting to concerts. Last outdoor festival I went to was an independent one put on by my local community radio station. Needless to say there were all sorts of music styles. Including some very heavy metal. I’d like to think it was the first time they’ve had someone knit to their music. Although heavy metal is good music to knit to.